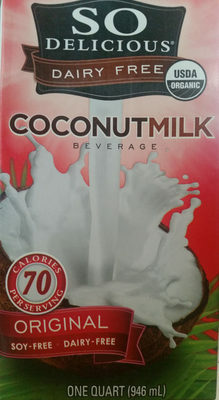 Organic coconut milk (water, organic coconut cream), organic dried cane syrup, calcium phosphate, magnesium phosphate, guar gum, xanthan gum, vitamin a acetate, vitamin d2, l-selenomethionine (selenium), zinc oxide, folic acid, vitamin b12. Product added on March 9, 2017 at 3:34:55 PM CET by usda-ndb-import. Last edit of product page on March 11, 2017 at 7:47:17 PM CET by kellmeister.